Love these skins. I have looked everyday to see if the same price will every come back so i can purchase another set for the future and place in the closet. It was so fun to be on the trail and flying into a turn on the trail and feel the bike off the ground. Then the bike came down and the tire stuck and grabbed the trail. Now thats fun!!!! This is a good overall tire. I have the 27.5x2.35 front and 27.5x2.25 rear. They seem to be very durable in 55a with minimal wear after a summer of rides. They roll alright but they do make a slight vibration on hard solid surfaces like the road. The transition while turning is very smooth and linear and the sidewalls and tread blocks give plenty of support even at low pressures. The grip is good but if you're on more slippery stuff, it will still slide a bit. As a rear tire, it has plenty of traction and grip but it rolls just a bit too slow for my liking. The 2.25 Schwalbe Nobby Nics rolled much faster. If you're going mostly downhill, it'd be just fine though. I'm thinking of trying the Schwalbe Magic Mary up front for comparison, which should have more grip but is more expensive and won't last as long. And that is what makes these Michelin tires a great value Good performance overall that lasts long at a very fair price. 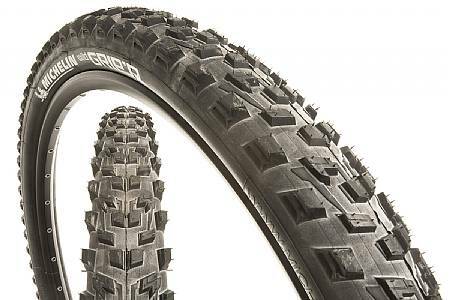 But as the other reviewer said, if you're going tubeless in a harsh rocky terrain, then you probably want to go for the reinforced version instead. If you ride in the rocks, get the reinforced! The reinforced casing is a must have here in the desert. Punctured the sidewall in less than a week.